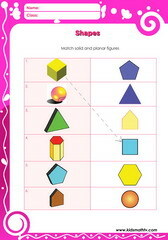 Math worksheets on shapes and geometry for children from kindergarten to 5th grades. 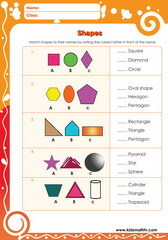 Teach children to trace shapes, recognize shapes like squares, triangle, circle, oval, pentagon and more. 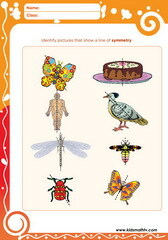 Also practice finding the area and perimeter of complex figures, circles and squares, understanding symmetry and more. These math tests on shapes and geomtry will serve well for classroom and homeschooling by parents and teachers of primary school kids. 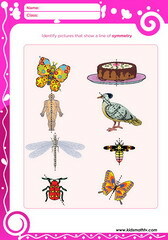 Also watch videos and play games offered for free on kidsMathTV. 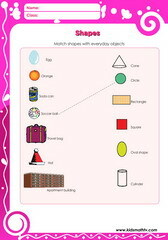 Practice Shapes worksheets 1 with this worksheet. Practice Symmetry worksheet with this worksheet. 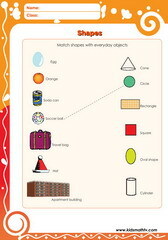 Practice Shapes in real life worksheet with this worksheet. 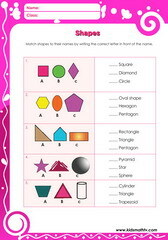 Practice Shapes worksheet with this worksheet. 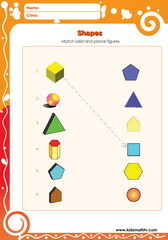 Practice Solid and planar figures worksheet with this worksheet.